While raising a car’s fuel efficiency is important, making the driver aware of the significance of environmentally-friendly driving habits is just as vital. Ongoing efforts are being made for the development of eco-friendly devices that operate as a communication interface between the driver and their car. 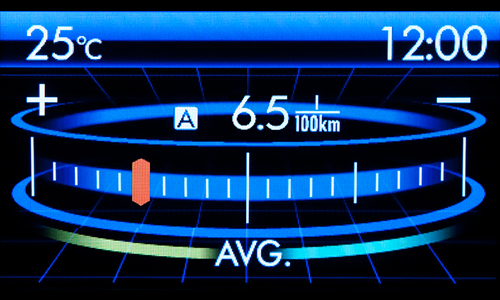 An “ECO gauge” has been installed within the meters to serve as a guide for fuel efficient driving. The pointer on the ECO gauge helps to notify the driver whether they are driving in an eco-friendly manner. By assisting the driver in keeping the ECO gauge pointer in the “+” area, fuel efficiency can be improved by about 5% (in-house measurements). * Measured in-house, may differ depending on driving conditions. 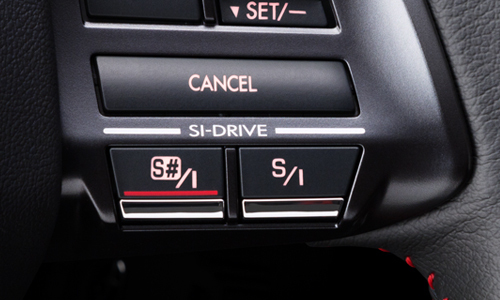 SI-DRIVE is Subaru’s proprietary drive assist system that offers three different driving modes at the touch of a single switch. SI-DRIVE is one solution developed by Subaru to extract the vehicle’s underlying driving enjoyment while also being mindful of the environment. SI-DRIVE offers driving enjoyment, from Eco-driving to sporty performance.